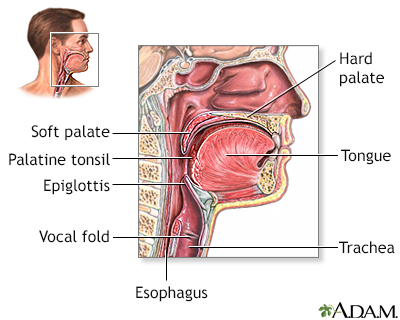 The adenoids are lymph tissues that sit in your upper airway between your nose and the back of your throat. They are similar to the tonsils. Enlarged adenoids means this tissue is swollen. Enlarged adenoids may be normal. They may grow bigger when the baby grows in the womb. The adenoids help the body prevent or fight infections by trapping bacteria and germs. Infections can cause the adenoids to become swollen. The adenoids may stay enlarged even when you are not sick. Children with enlarged adenoids often breathe through the mouth because the nose is blocked. Mouth breathing occurs mostly at night, but may be present during the day. Children with enlarged adenoids may also have more frequent ear infections. The adenoids cannot be seen by looking in the mouth directly. The health care provider can see them by using a special mirror in the mouth or by inserting a flexible tube (called an endoscope) placed through the nose. 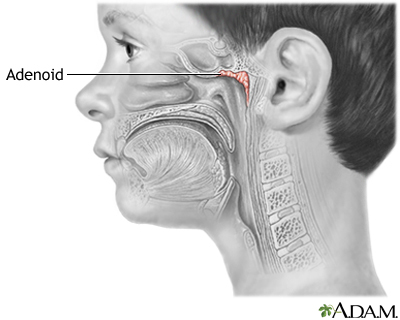 Many people with enlarged adenoids have few or no symptoms and do not need treatment. Adenoids shrink as a child grows older. The provider may prescribe antibiotics or nasal steroid sprays if an infection develops. Surgery to remove the adenoids (adenoidectomy) may be done if the symptoms are severe or persistent. Call your provider if your child has trouble breathing through the nose or other symptoms of enlarged adenoids. Yellon RF, Chi DH. Otolaryngology. In: Zitelli BJ, McIntire SC, Norwalk AJ, eds. Zitelli and Davis' Atlas of Pediatric Physical Diagnosis. 7th ed. Philadelphia, PA: Elsevier; 2018:chap 24.